I've stopped participating in reading challenges (although I'm tempted), but when I saw Sheila host this one over at Book Journey, it made me think. What do I want to do this year that I keep putting off? I like having goals and accomplishing them. This challenge seems a good way to do the things I want to, but don't make time for. 1. Go to BEA - I want to experience one of the biggest book events of the year. Last year I had my annual conference on the same weekend so I couldn't make it. This year BEA takes place on May 28-31st. Hopefully I can attend! 2. Read the whole Bible in one year - Even though I've been reading and studying the whole Bible for the last 23 years, I've never read it all in the span of one year. 3. Go to the movies by myself - I've always wanted to do this but thought it silly. Since I rarely watch TV (except for Masterpiece, of course), I think treating myself to a movie by myself will be satisfying. 4. Start a new business - I have entrepreneurial skills and I am itching to do more, I have been tinkering with an idea for a while, and this year I hope to make it happen! 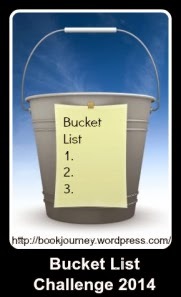 I know these are big things, but it IS a bucket list, after all, isn't it? I will be posting quarterly updates to track my progress in March, June, Sept and Dec. I hope you cheer me on! If you want to join me on this challenge, visit Book Journey and sign up!